Boy, is it great to be back fishing on the lower shore! Even though the winds have kept me off Tangier Sound on several occasions, I have been fishing a lot, and for a variety of species. Last Thursday and Friday I enjoyed the company of college buddy Tom Decker and friend Brian Eyler. 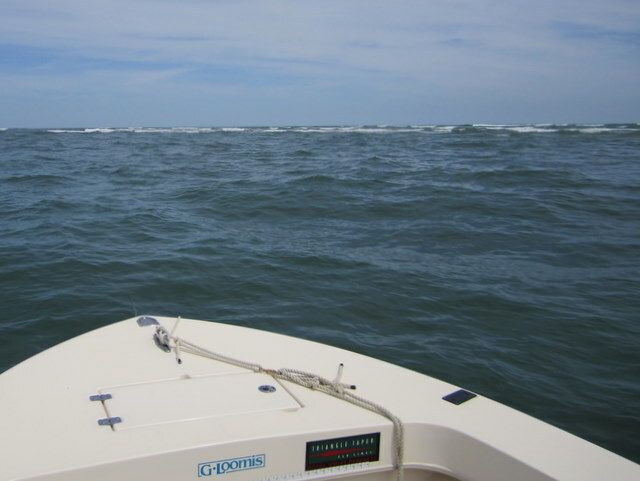 The plan was to fish out of Crisfield at least one of the two days but 25 – 30 mph winds nixed that idea. On Thursday we decided the Pocomoke might be a more relaxing venue. 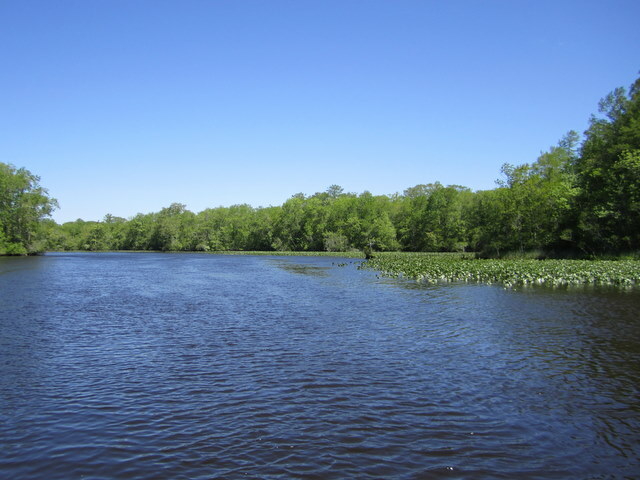 We put in at Byrd Park in Snow Hill and motored slowly downriver to some likely crappie holes. We caught a couple at the first spot but it wasn’t fast and furious by any stretch of the imagination. Down to Nassawango Creek we went. After some moving around and experimenting we started to get the crappie coming aboard. Every once in a while a bass or pickerel would surprise us and even white perch and bluegill liked our crappie jig offerings. Quite the variety. The 30 mph winds were present, but it was extremely fishable, and just a pleasant day on the water. All told, I guess we caught maybe thirty fish and six different species. On Friday, we decided to try something different as the winds were still upwards of 20-25 mph. We put in at Webster’s Cove in Mt. Vernon and headed to a nearby creek looking for white perch. The guys wanted to take a few home to eat. 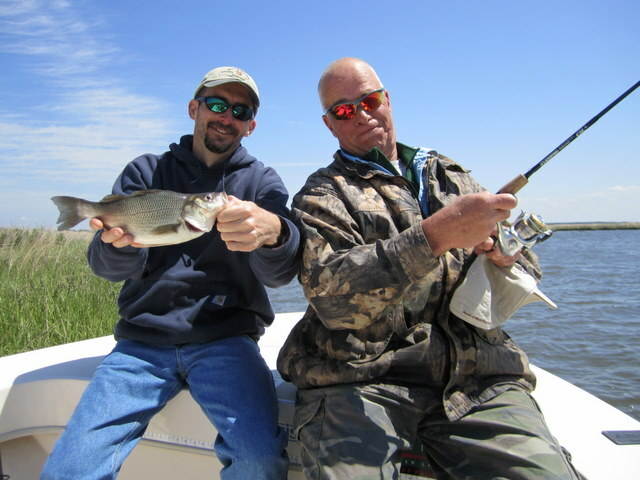 As the tide ebbed strong we began to catch white perch with the occasional rockfish (all rock were released unharmed). Since peeler crab seemed to be out-producing bloodworm we baited up with crab all-around, and as the tide slackened the perch got bigger. In three hours of fishing the guys landed maybe forty perch, with the biggest stretching the tape to 12 1/2 inches, and they had several more right at twelve. Saturday dawned bright and beautiful in Crisfield, with just enough of a westerly breeze to make the ride across Tangier Sound a tad bumpy. Fishing with Tom Hylden and Shelley Davis we decided to make the trek to the lee side of a string of barrier islands below Smith Island. Pulling up quietly to a long stretch of beach the water was flat calm. 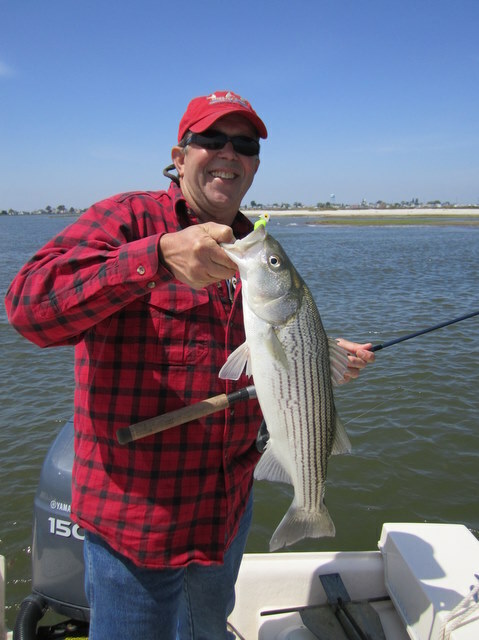 The first cast produced a feisty 17 inch striper for Shelley, along with a carbon copy on the second cast. 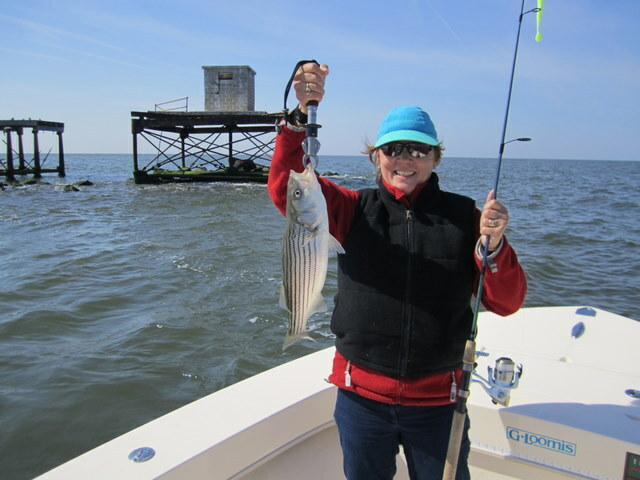 Before long both Tom and Shelly had several rockfish from 17 to 20 inches to their credit. As the tide and action slowed, we moved around to several locations and caught fish at just about every spot. 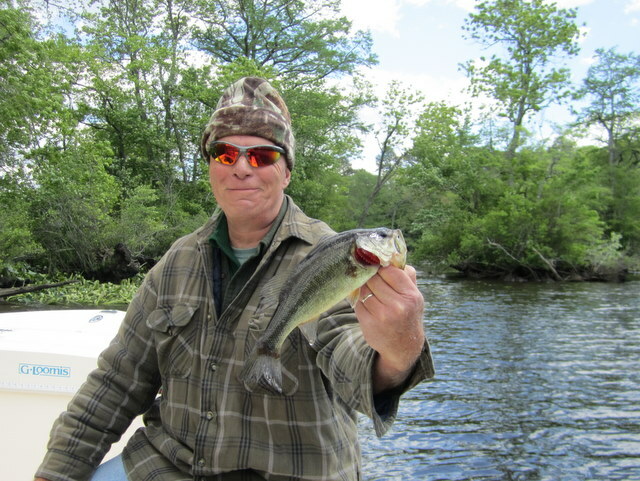 Tom had the largest of the day, a fat 22 incher that hit right near the boat and gave him a heck of a battle. Tangier Island was sitting pretty nearby and the breeze even let up for the ride home. Just a fabulously beautiful day on the sound with two great fishing companions. After enjoying a day off with the family on Sunday, I met Matt Roach and friends Jason and Eric at the Madison ramp on the Little Choptank river bright and early Monday morning. We started off working some shallow structure along the bay front with Stillwater Smack-it! poppers, hoping for a trophy rockfish that would be heading out of the bay after the spawn. It wasn’t long before Eric let out a yell as he was hooked up to something pulling drag big-time. 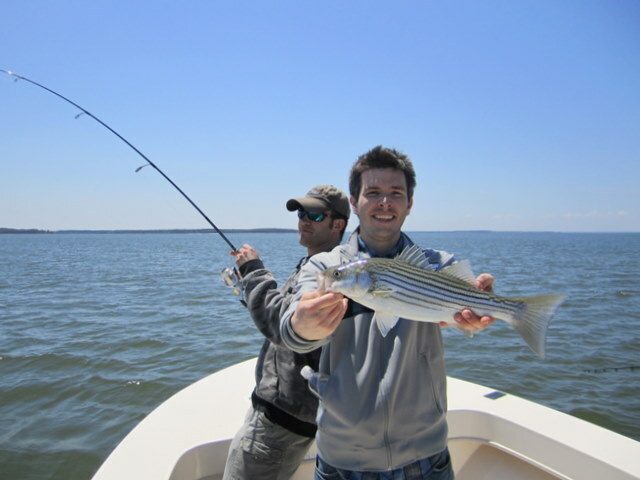 After several determined runs we finally caught a glimpse of the first fish of the day, a beautiful 32 inch striper. This turned out to be the biggest fish of the day, as once again the wind played a factor, and this day chased us up into the Little Choptank for some catch and release fishing. School stripers to 21 inches kept the guys happy while casting under the protected banks of the river. Jason's rock with Matt hooked up! Tuesday was a travel day with Doug Andrews and Bernie Kemp. We were on a mission to catch some of the trophy red drum that have been prowling the flats off Fisherman’s Island down near the CBBT in Virginia. We met in Pocomoke and drove down together in my Ford truck, and I enjoyed the company as we planned out strategy. After stopping at Chris’ Bait and Tackle for a few last minutes odds & ends, we put in at Wise Point and readied the rods for some sight-fishing. Not a sure thing by any means, but it’s best to be prepared. After cruising the flats between Fisherman’s and Smith Island for perhaps an hour, we decided to anchor-up along a likely looking sand bar and fish peeler and hard crab baits for the drum. After Bernie caught a couple very large rays, Doug and I had two run-offs that we determined were probably drum due to the speed with which the line was leaving the reel. On both occasions, before we could get a hook-set the fish was gone. To make a long story short, the remainder of the day was spent catching skate, monster rays and one feisty dogfish at several locations on the flats. If you can call it a bright spot, we felt right at home with the locals as we didn’t see a drum boated during the entire day. This spring run of drum can be frustrating as you can experience many hours of sheer boredom interrupted by an hour or so of sheer pandemonium. So far this season, I’ve yet to get to the pandemonium part. Oh well, it was a beautiful day in a beautiful place with two great friends. Thanks guys! We’ll get ’em next time.. 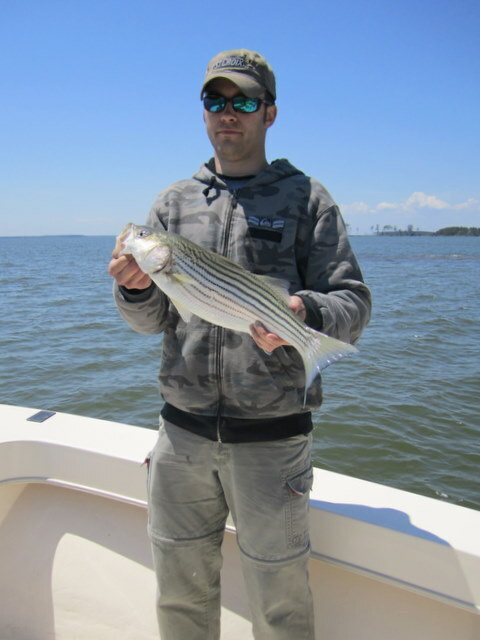 The shallow water, striper topwater action is just heating up and will peak during June and July. Last year we had terrific action and explosive strikes from rockfish during the low-light periods of dawn and dusk. 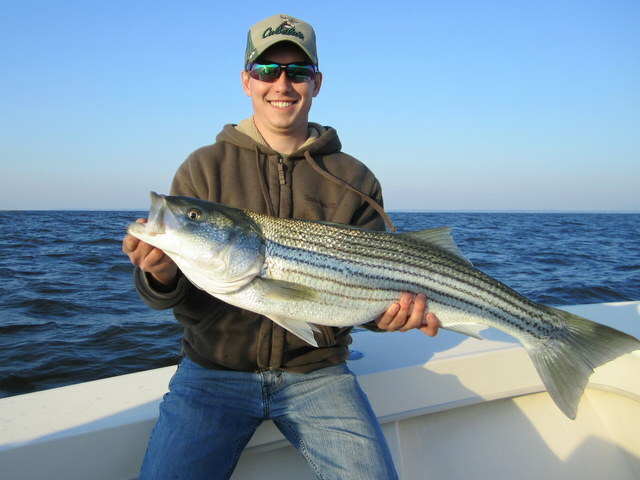 If you want to experience one of the greatest thrills in all of striper fishing try shallow water topwater. A half-day morning or evening trip is perfect for some fast-paced excitement with this great gamefish. Both Crisfield and the Little Choptank produced rock to 34 inches last year.